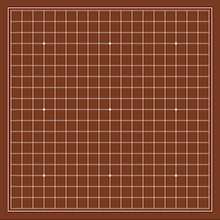 A long time ago I learned the basics of the ancient Chinese game of Go, or 圍棋 (wéiqí) as it is called in Mandarin. I hadn’t played in years, but recently a good friend has reintroduced me to the game, and now I want to understand it better. As I learn about gameplay and strategy, I thought it would be an interesting exercise to write little computer programs that reflect the concepts I’m learning, mostly because I’m curious to see what sorts of things I end up making. This entry was posted on Thursday, August 29th, 2013 at 7:56 pm	and is filed under Uncategorized. You can follow any responses to this entry through the RSS 2.0 feed. You can leave a response, or trackback from your own site.